The Ferrari FF has inherited a new meaning for its 'FF' abbreviation; Fire Friendly. 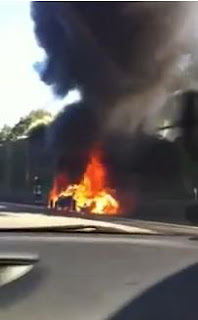 According to local media in Germany, a 44 year old owner of the FF was test-driving the supercar on the Autobahn in Frankfurt when he heard a “loud bang” and detected flames coming from the rear of the supercar. Pulling up safely on the side, he watched the €370,000 supercar roast as smoke billowed from the vehicle. The cause of the fire is unknown but Ferrari recalled around 1,200 mid-engined 458's last year due to faulty wheelarch adhesive.